You might notice that I don’t often wear a watch in my posts. I have occasionally, like I did with my khaki Timex. But I often figure that my phone has a clock, so why bother? 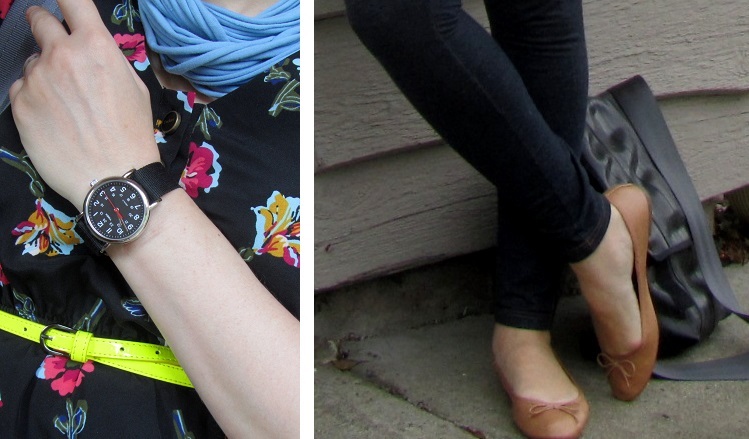 Well, Timex reached out to me to see how I could add a watch to my outfits. 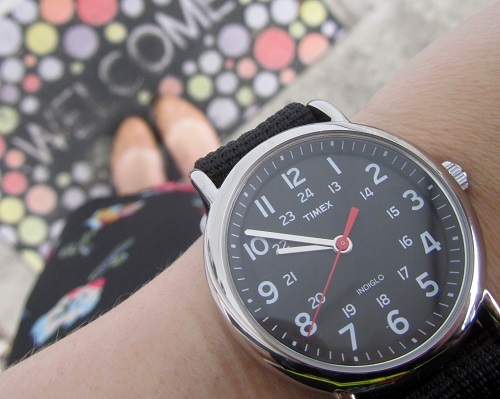 When I like a style, I often pick several in different colors, and this watch was no exception. It’s the same as my other Timex (with silver instead of bronze-tone metal). Now that I have two, I can swap bands and wear silver and khaki or black and bronze if I like. I also found straps in other colors on the Timex site. Now I can turn two faces into a bunch of watches! I chose this style the first time because of the large, simple face and because the band is non-leather. Even though I might not always need the time on my wrist, a watch is a great fashion statement. I think you’ll see watches appearing more often in my posts. Do you wear watches? And to wear with my watch? My fall floral dress of course! 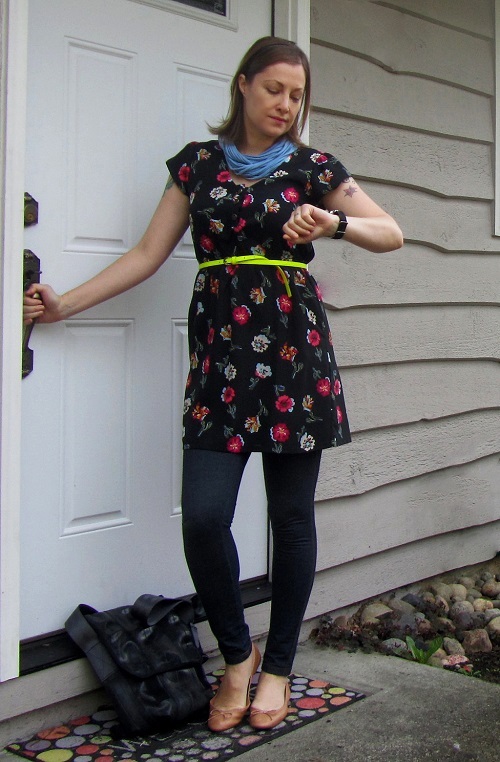 A few of you recommended skinny jeans for this dress, and I’ve done just that. They’re actually denim leggings (I hate the word jeggings). They’re perfect under a long tunic or short dress. No zipper or pockets means no lumps or bumps. My dress lies smooth. I’ve been using this recycled innertube bag a lot lately. It’s deep enough to fit my laptop and the normal things I carry with me. I’m joining The Pleated Poppy and Transatlantic Blonde for link-ups today. Check out what everyone else is wearing! What a cool watch! Big, bold and funky look: definitely tells more than time, tells you’re in style! I love the fact that it has real numbers instead of digital. Great retro look. I have a Timex watch (totally reliable) but I need to wear it more often, perhaps TIME to invest in a new one (pun intended!). I like how versatile yours is and the non-leather strap is my choice too! 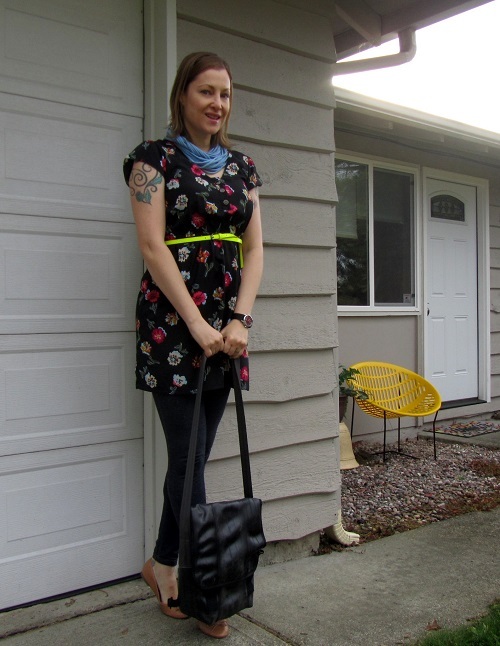 Your outfit is adorable, I so agree, I don’t like to call them jeggings, but I love them for the reason you stated–no lumps and bumps caused by pockets and zippers! I’ll be watching you (haha) to see if you’ll be wearing a watch in future posts.